This indica dominant feminized outdoor photoperiod variety was selectively bred over several seasons in the Pyrenees. 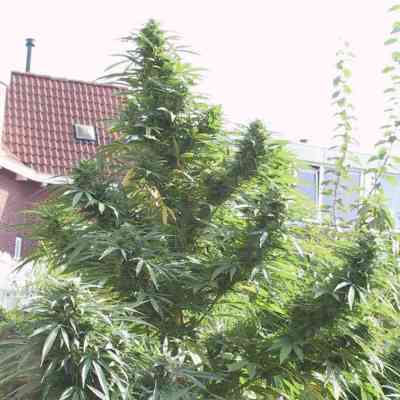 The genetics came from the green phenotype of Frisian Dew crossed with Hash plant. The goal of the hybridisation was to retain the tough outdoor growing characteristics of Frisian Dew and combine that with the high potency levels of the Hash Plant. The best performing offspring were crossed each season until a stable and consistent result was achieved. Frizzy Kush is ready to harvest in the first 2 weeks of October (northern hemisphere) or the first 2 weeks of April (southern hemisphere). Yields are heavy, 500-1000g is possible in good outdoor conditions. The taste is sweet and the genetics also grow well indoors taking around 8 weeks of bloom. Expect THC levels of over 20% and heavy yields from this potent and tough variety.